Where to learn Forex trading ? Why is Bitcoin a unique opportunity ? Wealthy Affiliate Review: better than Trading? So, why should you trade bitcoin ? Has Bitcoin bottomed out? Is this the point of capitulation? Hold on or Exit ? Do you keep asking yourself: should I buy Bitcoin ? Or maybe you already own some, and you’re wondering what to do with them : sell everything and put in in stocks ? Wait for the next boom ? The only strategy I seriously consider for Bitcoin is a long term buy and hold. An accumulative strategy if you like. Call me a Hodler, yes. When I say Long Term, I mean 5 to 10 years, at least. Since the price swings in bitcoin are still huge, I don’t see it advisable to trade bitcoin short term, unless you’re an expert scalper. There’s also regular suspicion that heavyweight investors or bots are manipulating Bitcoin prices. Every now and then, a story comes up, such as this one on a single trader nicknamed “Spoofy”. And yes, there’s a lot of talk that the Bitcoin market could be manipulated. Check out this article on CNBC. But hey, forget the noise. As a trader and investor, there are times when you come across unique opportunities. Bitcoin and cryptocurrencies are just that, and I’m going to explain why in a moment. But before I jump in, let me say that this post isn’t going to tell you how Bitcoin works, what is is or what the Blockchain is. If you wish to learn about these things, or are a total Bitcoin newbie, read my post called Bitcoin explained. I’ve also made a great Infographic on Bitcoin if you want to look at it. 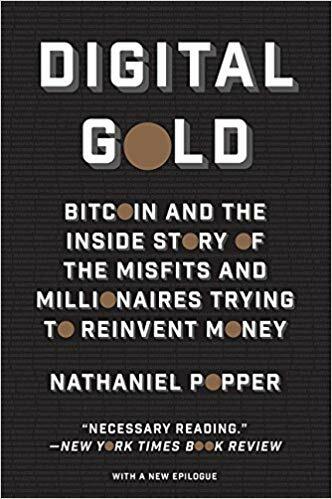 And there’s also an excellent book I recommend, it’s called “Digital Gold” by Nathaniel Popper, giving you the inside story on the misfits and millionaires trying to reinvent money. You can give it a try. First of all, because of its massive reward potential, as simple as that. As crowds flock to the digital revolutions of Blockchain and Bitcoin, we are only at the beginning of a huge wave of interest and price appreciation. Some people talk about a bubble … like the dot.com bubble in 2000. Ok, sure there was a bit of irrational exuberance, with company valuations in total disconnect with their real intrinsic values. But didn’t the Amazon, Netflix and Google end up by totally changing the world we live in? Well, I believe it’s the exact same thing for Bitcoin and cryptos today. It’s a revolution in its infancy. Now coming to price, in an article Newser in May 2017 calculated that if you had invested $100 in bitcoin in 2010 you would have be the proud owner of a whopping $75 million (when Bitcoin stood at $2,251) !! This is what I mean, there are little to no assets with the potential to grow that high that quickly. Bitcoin has no intrinsic value, it cannot be related to any form of asset or economic aggregate. I don’t know of any other asset or investment in history that has carried such reward ratios in such little time. So sure, it has been (and will be) a bumpy ride, but if you are careful enough to expose only money you can afford to loose, no matter how small, you could be on your way to surfing one of the most powerful investment waves in history. 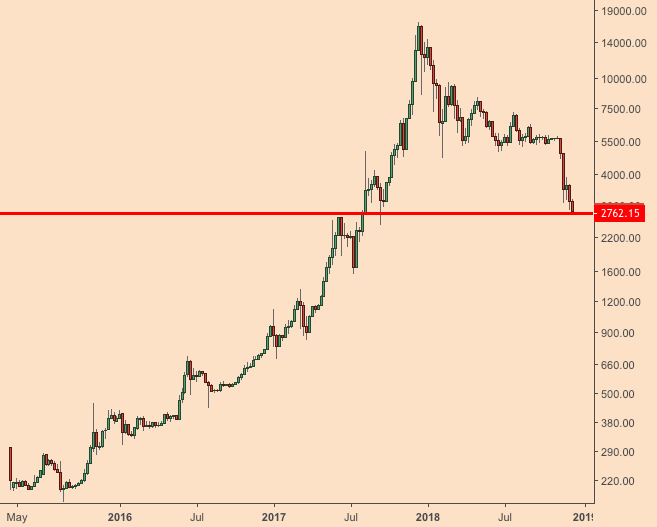 At any point in time, when Bitcoin retraces violently, you will ask yourself this question: has it reached a bottom ? The bottom is what we call the Point of capitulation. This is when traders give up, they become fearful and loose their nerve. At that point in time, price usually forms a bottoming pattern. Another thing you can look at are the key levels, such as the 100 or 200 moving averages. You will notice Price often reacts around them. Yes, some prominent stakeholders have been making claims around bitcoin prices reaching sky high valuations. Max Keiser and John McAfee being two of the most vocal. Max Keiser thinks it is heading for $10,000. John McAfee has made the bold prediction that Bitcoin would reach $1,000,000 by 2020. He regularly revises that forecast. 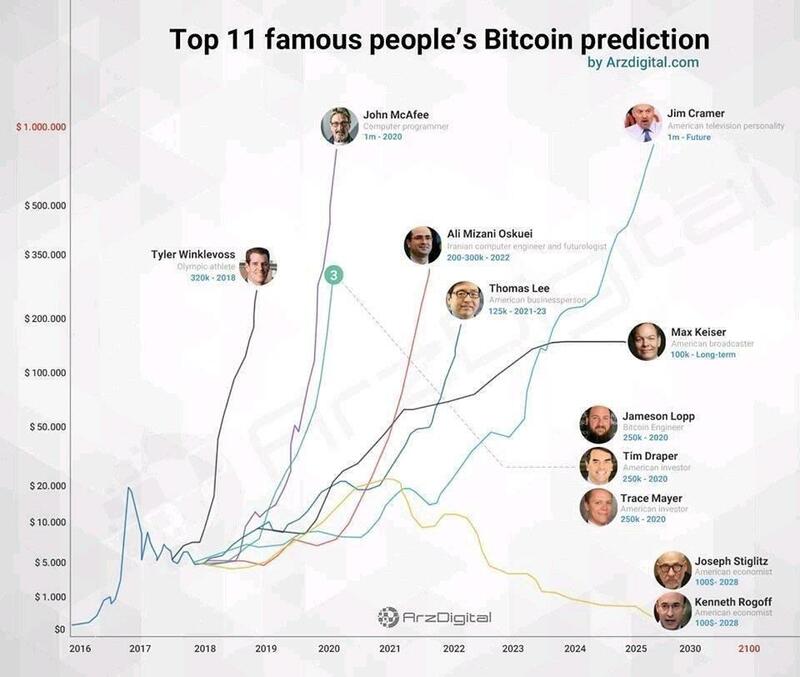 Below is an interesting graph with some of the predictions made, as you can see some of them are quite bold. Interest in India following a study by a Research Group founded by India’s Central Bank. The Chicago Board Options Exchange (CBOE) has also announced that it will start listing Bitcoin futures and create a futures market. And it is a matter of time before the SEC approves the first Bitcoin ETF, which could also open the door to further significant interest from the wider financial community. Basically, when a bitcoin ETF becomes possible, anyone with a simple brokerage account can trade it. I believe the day that is announced you will see one of the biggest waves of buying interest the bitcoin has seen. Just imagine when funds (investment funds or mutual funds) start investing in Bitcoin. There is also increasing demand for cryptocurrencies linked to ICOs (Initial Coin Offerings), by which startups create new digital offerings or currencies. It is the same as IPOs except that investors purchase tokens issued by the Company. All of this is a kind of War of Money, between the old currencies (called Fiat) and the new cryptocurrencies. That war definitely has an impact on volatility. Bitcoin is clearly getting increasing media coverage, and a lot of people are waiting for the right time to enter the market. In May 2017, Bitcoin made it to the top 5 google searches. See this article from Cointelegraph. Lastly, on a personal level, the volume of questions that I’m getting from a small circle of friends and colleagues are another indication that what we are seeing is only the beginning of a massive wave. Out if all the available cryptocurrencies out there, Bitcoin still has the largest market cap, representing roughly 50% of the total cryptocurrency market capitalization. By design, Bitcoin is also in limited supply, and this is key. Its creators have capped the number of bitcoins that can be mined at 21 million. Howmuch.net has published an interesting article showing Bitcoin’s value in relation to other key world assets. Gold for example represents 200x the total value of Bitcoin. Bitcoin is not related to the global economy, but to a technological revolution that embraces a currency that is global, safe, anonymous and with low transactions costs. Many people believe it can be a store of value in the long run. You can also trade Bitcoin absolutely anytime, anywhere, 24 by 7, unlike stocks or forex (which halts on weekends). Buying Bitcoin is an opportunity to take part in a technological revolution extremely easily, at a very low cost. Buying Bitcoin doesn’t have to be costly, you can buy small fractions of it, making it possible for anyone to own some. The smallest unit of bitcoin is called a satoshi, it represents one hundred millionth (0.00000001 BTC), and took its name after the mysterious founder of bitcoin Satoshi Nakamoto. As trading volumes increased, Bitcoin transactions had started suffering from delays, costs and other issues. In order to solve that, the decision to activate Segregated Witness (Segwit) was taken on August 1st and enforced on August 23rd 2017. It produced what is called a Soft Fork. I won’t go into any of the technical details behind these complex decisions, but they have given Bitcoin extra capacities for transaction volumes and speed. the still relatively low rate of adoption of this cryptocurrency. Both these factors are absolutely massive, and pretty rare in an investors lifetime. I am convinced there is a a strong case behind investing in Bitcoin in the long run to take benefit of both. So let me tell you about my Strategy. Since my objective is long term, I am moderately concerned with my entry points. Sure, Bitcoin had a catastrophic last quarter of 2018, but I firmly believe that in the Long run the only way is up. The technology is just too transformative. I know, not easy to sit tight when you’ve lost 50 to 60% of your investment right ? now is precisely the time when you have to sit on your hands and take the pain. So, to me the best way to catch the bitcoin wave is not to second guess the market. 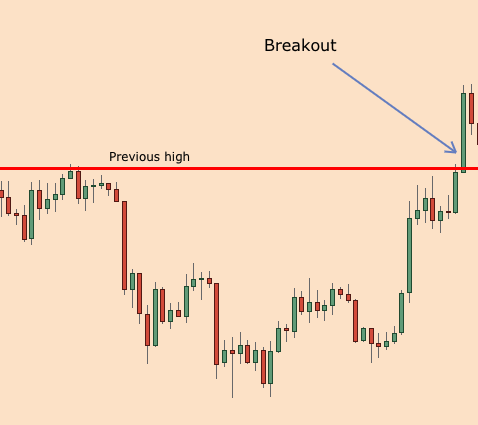 The most simple way to trade it is by entering on breakouts when it breaches key levels. You should not try to average down, never, not with Bitcoin. Instead, let the market tell you when you have to get in => let prices fall as low as they can, then watch for a breakout and shoot. So how do you find breakouts ? To find a breakout, very simple, you need to map the previous highs. To do that, draw a line on your previous high points, this is going to be your resistance, or pivot. A breakout will simply be a close of price above that line (see the graph). So all you need to do is map out the previous highs and wait for price to breach that level. I recommend mapping the previous highs on a weekly chart, not a daily chart, so that you only get in on the significant moves. When price closes above, enter long. Of course, this is Bitcoin, so you could have massive fakeouts, or violent retraces, but at least you will have put some chances on your side by acting based on price action and not pure guesswork. Remember that trading Bitcoin is a very, very, very speculative activity. Volatility of Bitcoin prices can be huge, daily variations of 5-10% are not uncommon. Furthermore, trading with leverage or with tight stops can be lethal. So there is one absolute recommendation => forget traditional money management using stop losses, it is absolutely key to forget trading Bitcoin like you trade stocks, Forex or any other traditional asset. 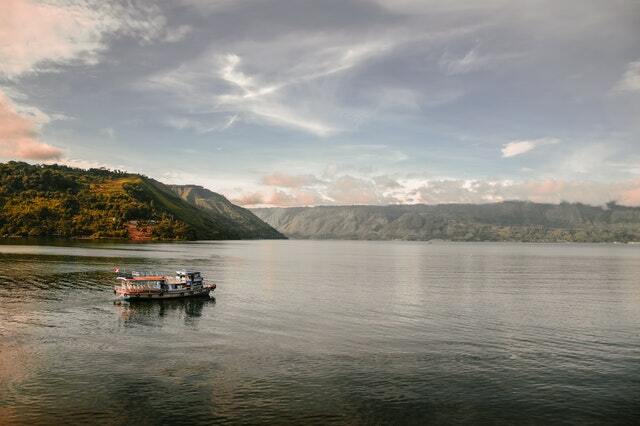 You have to define beforehand what amount of money you are ready to loose, and that’s your money management, full stop. Unlike stocks or Forex trading, do not use stop losses or you will inevitably get hit by brutal volatility spikes. Usually it would not be recommended to trade more than 1% of your account on any of your entries. This is very unorthodox but Bitcoin is not yet an asset that can be traded like stocks or Forex. You cannot yet allocate the same amounts of money to Bitcoin trading (unless you can afford to). By playing long term we are considering breakouts as buying opportunities, the market tells us to get in so we go with his flow. Now, if you’re in the trade and things start to improve and Bitcoin prices start climbing again, things could skyrocket quite fast. Then, you’ll have two options. I recommend you choose which one you’ll follow before you even get in, and then stick to it. Otherwise your brain and psychology will play tricks on you. The first option will be to just to Hold tight and do nothing ! You will become a HODLER. Let me tell you it’s going to take some guts, because if you’ve followed the downhill race of Bitcoin since end of 2017 you’re in for quite an emotional ride when things go up again. You will have to be patient and disciplined. Follow the price of Bitcoin on a weekly chart. Concentrate on the big picture, don’t get polluted by the noise. Use a logarithmic chart to look at Bitcoin price evolution in the very long run. A logarithmic scale looks like this (on a Weekly timeframe). It greatly flattens out the variations. Interestingly, you will notice that in December 2018, Bitcoin is sitting on a major resistance area. Both of these things will make it easier for you to be patient and catch the big long term move. The second option you will have is to sell your coins each time BTC price reaches a designated level, usually defined through technical analysis. That could be for example a Fibonnaci retracement, or the next resistance level. That exit strategy will give you regular profits, but you might miss part of the momentum on the way up. So as you can see the strategy is very simple, even simplistic. But it takes some serious patience and stamina, and let’s be honest, courage to get in. The potential for upside is important, but the downside can be just as steep. Just pick which side you are on and let the market guide you. Anyway, I’d love your opinion. Do you already own Bitcoin ? Are you planning on buying any ? Drop me a comment below. Safe trading to all.